IT MAY have looked like all the animals had escaped from Alexandra Park Zoo at the weekend but fear not, the collection of animals running freely around the Bundaberg Botanic Gardens were all a part of the second annual Furries in the Park event. 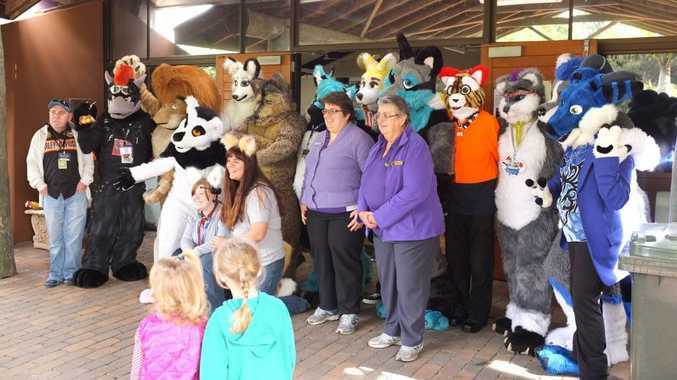 Event organiser Hayden Grant, also known as Bingo Fox, said it was an unreal day and crowds had gathered even before the furries arrived to check out the costumes. "The kids, the families, they all thought it was fantastic," he said. "They were so impressed with all the work everyone puts into their fur suits and I think we all posed for about 100 photos." But the costume gaining the most attention was the Warg from Lord of the Rings. "Everyone in the gardens swarmed around to have a look," Mr Grant said. Plans are already under way for next year's event.